The speech took place at the United Nations located in New York. Members of the delegation from the U.S., Canada and Israel were not in attendance. Ahmadinejad blasted Israel for relying on military threats and intimidation, which he claims have led to a divide in international relations. The speech came just a day after President Obama told the same assembly that a threat to Israel would be imminent if Iran were to reach nuclear capabilities. Prime Minister Benyamin Netanyahu has also chimed in and said that Iran must not be allowed to obtain nuclear weapons. 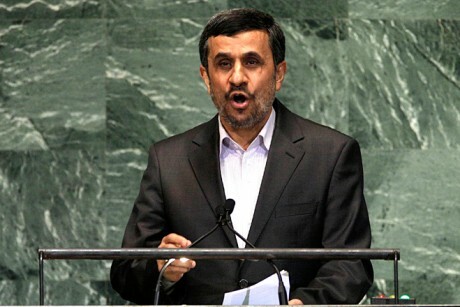 Overall, Ahmadinejad’s speech was surprisingly subdued. Most in attendance expected the Iranian president to spew out a fury tongue lashing at Israel; however, his tone was less provocative than what most are accustomed to hearing. Aside from Israel, Ahmadinejad also spoke of the return of Jesus Christ along with the Islamic end-time messiah, the 12th Imam. He called for peace among people of all spiritual backgrounds and insisted that there is no hostility between people of different faiths. He also emphasized on the importance of human rights and called for the end of oppression, poverty and discrimination. He further went on to say that the return of Christ and the Imam will put an end to all wars and bring about everlasting peace. Like most other Muslims, Ahmadinejad believes that Jesus was one of God’s prophets but that he was not a divine figure. The nature of the speech by the Iranian president has certainly caught many off guard. CNN commentator Piers Morgan says that for a man of Ahmadinejad’s nature, the speech was actually reasonable and low key.